This recipe seems to be working well for me, although, one day, I'm going to try the Heston Blumenthal version as that sounds good too. One day, I might try and do it without tomatoes too, as they don't use them in Bologna, but I'd want to use a decent beef stock, rather than stock cubes. When making this, I first chop up the Onion, Carrot and Celery for the Soffritto. Personally, I like this to be equal portions of the ingredients once chopped up, so the quantities above may vary depending on the size of the vegetables. Using a heavy pan, heat up the olive oil and when hot, but not smoking, add in the pancetta and cook for a few minutes. Then add the soffritto and cook, stirring regularly, until the onion becomes slightly transparent. Next the mince beef goes in and is cooked until slightly brown. Then in goes a large glass of wine which should reduce by a third until the rest of the ingredients are added. The sauce should then be left to simmer for at least 2 hours. You can get away with less time, but it is very much better the longer it is left. 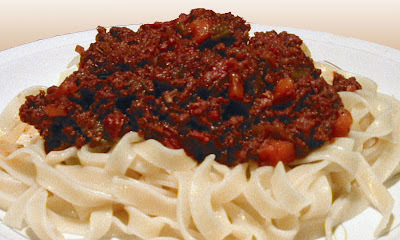 You can serve it with almost any type of pasta, but tagliatelle is the more traditional one to serve, even though in the UK we tend to use spaghetti, hence the Spag Bog nickname. My friend Brett would also add some fresh coriander, and if I'd have had some, I may well have tried that myself as his sauce was always good. This sauce definitely scored pretty high with my friends who tried it, even though Ejaz's scores always tend to be one point lower than anyone else's. Maybe he's just trying to encourage me to improve more, or otherwise he's been spoilt by his Mum's cooking. Still... scores between 7 and 9 out of 10 will do me. Not sure what, if anything I will do next time I make it. I liked it, and with clean plates and no leftovers, it couldn't have been bad.